A 10k run is a popular distance choice for many reasons. It’s a gateway for runners who eventually aspire to run half and full marathons; it gives you an idea of what longer races feel like. Even when you’re not racing, a 10K training run is an excellent workout distance to build stamina without testing the limits of your body. Depending on your pace, running a 10K involves being on your feet anywhere between 30 minutes to a little over an hour. If you’re running sub-40, that means you’d want (not need, though) a shoe which feels fast. On the other hand, if finishing a 10K takes an hour or more, then you need a shoe which also has enough cushioning on tap. In other words, it has to be a running shoe which meets the speed+endurance requirements of a 10K run. If you’re wrapping up 10K runs in under 40 minutes, then perhaps you’d like to read our buyer’s guide for 5K races. Those models will do just fine for fast 10K paces. 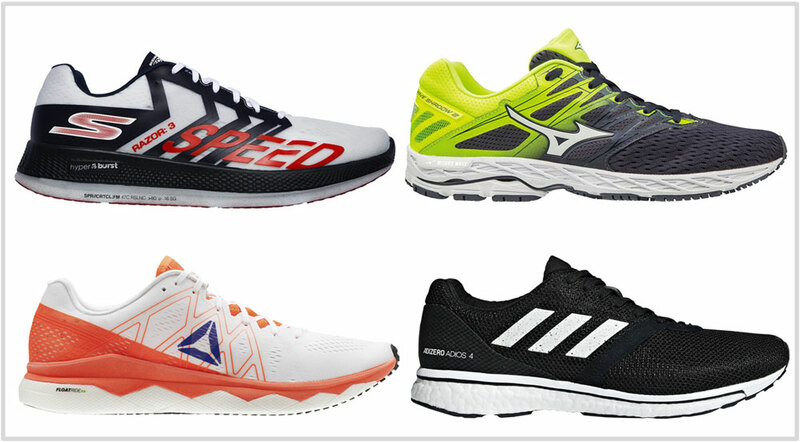 Given the context, we’ve put together a list of recommended shoes which work for both categories of runners. So regardless of whether you’re running a 35 minute or an hour+ 10K, these shoes will do a splendid job. There’s another reason to consider this list. You can also use these shoes for half-marathons, a distance where thinner racing flats (otherwise suited for 5K races) could be found lacking in cushioning. Our selection criteria is rather straightforward. 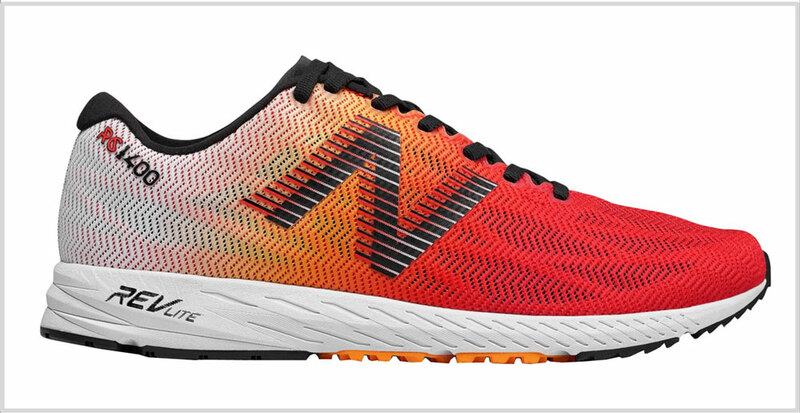 The shoes below have a good blend of cushioning and fast; in other words, they’re lightweight trainers with enough midsole to go the distance. From a category point of view, these models sit halfway between full-blown trainers (Saucony Ride, Nike Pegasus et al.) and hyper-light racers like the New Balance Hanzo S V2. The adizero Adios 4 gets an all-new mesh upper inspired by the adidas sub 2 model. Except for a thin strip over the midfoot, most of the suede overlays seen on the past few Adios models are gone. The toe-box and forefoot are supported by an internal bumper which makes the forefoot slightly narrower than the Adios 3. And as always, you will need to buy a half-size larger for this tight-fitting shoe. Other than that, the Adios fits flush over the foot for excellent support during speed runs. The insides aren’t what you would call smooth – it still has the coarse feel associated with this series. You’ll need to wear socks with the adios. A full-length Boost foam midsole is paired with a durable Continental rubber outsole. The low-profile midsole has enough cushioning for 10K and beyond while feeling fast and stable. We prefer the grippy forefoot of the adios 1 and 2 though. The Boost version of the Boston debuted a few years ago, and since then, it’s built a solid reputation as a cushioned lightweight trainer. The simple mesh and synthetic upper is modeled on classic racers, and the low-profile Boost midsole provides plenty of fast cushioning for runs of up to a half-marathon. Also consider the adizero Tempo 9 if you want greater medial side support, or the adios 4 if you want a lighter shoe. The only good thing which came out of the $250 Asics Metarun was Flytefoam. Asics desperately needed a lightweight midsole foam material, so Flytefoam’s introduction was very timely. Flytefoam isn’t the most engaging of foams, but it is lightweight and more durable than standard Asics foams. The 9-ounce Flytefoam makes the Dynaflyte 3 ideal for fast 10K runs. The Ortholite insole is soft but the midsole is very firm, so there’s very little efficiency loss. The firm base carries the foot through the gait cycle regardless of your foot-strike position; underneath, the full ground contact outsole grips well. The upper is plush for a shoe of this class. More specifically, the heel and tongue use premium materials and quilted foam to provide comfort inside what is a tight-fitting upper. Also see: The Asics DS-Trainer 24. Mizuno used to sell an excellent shoe called the Sayonara. The 2nd version was the best, and it went downhill from there. The Shadow aims to capture some of the Sayonara magic, and it succeeds to a certain extent. The outsole has an aggressive lug pattern for push-off traction. The large Wave plate works perfectly in tandem with the firm foam midsole. 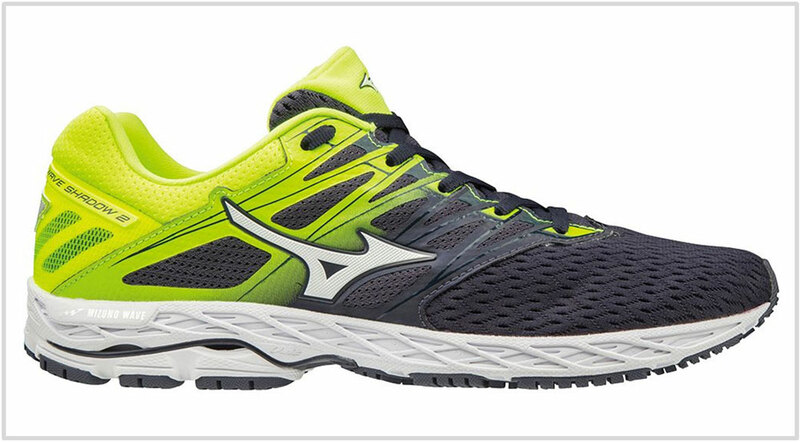 The Wave plate creates a stable and snappy base under the rear and midfoot before handing it over to the forefoot. The resulting ride quality feels fast and smooth – ideal for a 10K run. The upper fit is comfortable and goes easier on the feet than other ultra-tight fitting shoes in this segment. We like how Mizuno uses thinner midfoot panels on the Shadow 2 for better movement. The 1400V6 features on another buyer’s guide for shorter races, and that’s because the 1400 is an excellent do-it-all shoe. The Revlite foam midsole is adequately cushioned for 10k distances without sacrificing the ‘fast’ feel. The mesh upper has a snug yet smooth interior which blends comfort with a secure fit. The Zante Pursuit, along with the adidas Boston and Reebok Floatride, are one of the cushier shoes on this guide. So if more ride comfort is what you’re after, you know where to find it. The Pursuit replaces the Zante V4 (the name gives it away) and has similar qualities which made the Zante series appealing. The shoe is just over 7-ounces, so that’s less shoe per mile. The low-weight doesn’t come at a cushioning trade-off; the sleeved all-mesh upper helps keep the weight low. The Fresh Foam midsole is good for distances of up to a half marathon so it can tackle 10k+ distances without a problem. The low-profile midsole cushioning helps build the Pursuit’s case as a fast, lightweight shoe. On our list of shoes for 5K races, we featured the Streak LT4 – a lightweight road racer. The Zoom Streak 7 is a more ‘cushioned’ version of the LT4, though that’s purely in a relative sense. The Streak 7 has more midsole volume than the LT which makes it more comfortable while delivering the speedy ride experience. The airy upper delivers a smooth and secure fit quality. Reebok’s recently released Floatride foam platform is like an improved and lighter version of adidas Boost. And it makes sense, because Reebok is owned by the adidas group. Since its first use in a sports-casual model, the Floatride foam has gradually found its way into the more serious part of Reebok’s performance running line. We see the Reebok Floatride Run Fast as a lighter and faster version of the adidas Boston Boost. The shoe features an EVA rim over the Floatride midsole for stability. The Floatride foam works as advertised, and on the Run Fast there’s just enough amount of it for speed-friendly cushioning. The outsole is completely covered with granular lugs for best-in-class grip. The Run Fast’s narrow upper fit is standard fare for running shoes of this category, so no surprises here. Reebok (and adidas) should offer widths though. Saucony has an excellent history of making racing shoes, be it for road, XC, or track. The storied legacy reflects in the Type A8 – a lightweight and padded road racer with a soft and a minimal upper. The 4mm drop midsole has just the right amount of cushioning and fast feel for runs of 10K to a half marathon. The small lugs on the forefoot rubber outsole provide excellent traction for toe-offs. To the outside world, Skechers is known as a family footwear brand. If you visit its website, you will see a vast assortment of affordable athleisure shoes for everyday use. But every now and then, Skechers shows everyone what it’s truly capable of. Many gems have come out of the Californian brand over the last several years, the latest being the GoRun Razor 3 Hyperburst. Skechers calls its new midsole material HyperBurst – a lightweight and responsive foam material not found elsewhere. It has excellent rebound properties while helping the Razor 3 achieve an incredible 6.5-ounce weight. The Razor 3 is a shoe which feels at home during faster paces than it does at lower speeds. The Razor 3 Hyperburst has a fit snug and is true-to-size for a racer – that said, some might need to go a half-size up for comfort. Admittedly, Skechers isn’t exactly a brand on everyone’s radar when looking for a cushioned road racer, but this new intro has serious street cred. All in all, it’s a great pick for running a 10K road race. A full review will follow soon.